We didn't really know what to expect from Cambodia apart from the widely advertised Angkor Wat complex, but it turned out to be a great 2 weeks in a really interesting country. Very easy to travel around by boat and bus and quite a lot more to see than we expected. 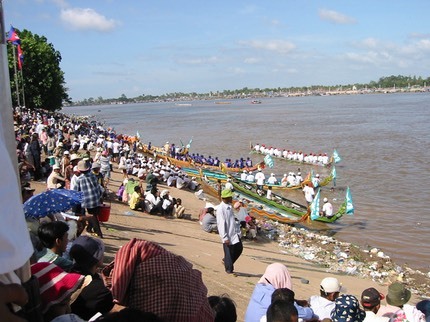 We arrived in Phnom Penh just as the festival was being held for the Tonle Sap river which reverses its flow twice a year as water flows back from the Mekong Delta. Just like Henley, without the dress code. We had a $5 room here which flooded on our first night. 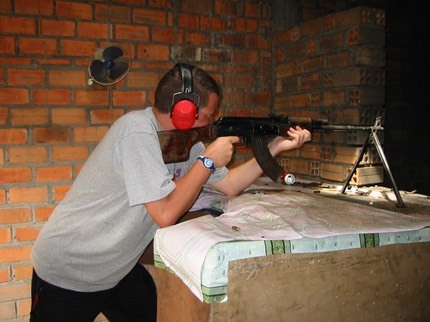 A couple of moto drivers took us out the following day to a firing range where you can try out a heap of different weapons. For $20 we got a Kalashnikov with a full clip. Cool. After this we went to the killing fields for a thoroughly moving look at bones and skulls and torture implements. Incredible to think this was going on whilst we were seeing The Jam live in London. 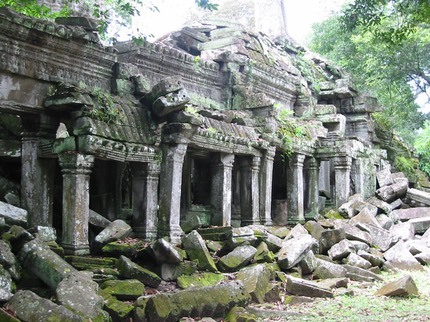 Around Siem Riep are the Angkor complexes containing famous ruins like Angkor Wat and smaller ones all in different states of collapse or restoration. Tomb Raider was filmed here. We spend 3 days here and you could easily spend more. 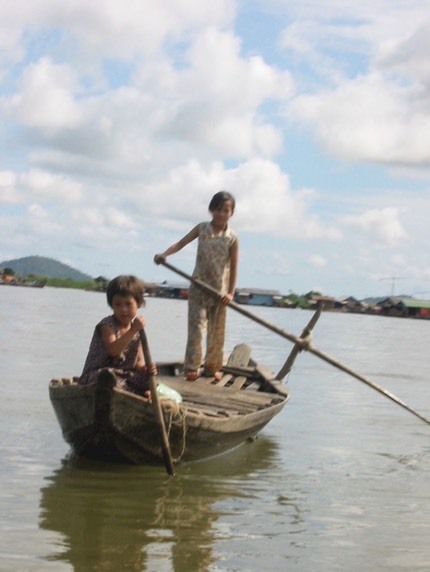 From Siem Riep we caught a boat to Battembang the ancient capital for some more temples before heading down to Kompong Chnnang a small town on the edge of the Tonle Sap. Rooms were hard to come by as the United Nations had bagged all the good ones so we got an insect infested shed for $5. The only attraction on offer was to be rowed around a floating village for a few hours so we did this to get some good photos (not the one here by the way which is out of focus). Back to Phnom Penh to wind away a couple of days before heading back to Bangkok.